Last month at the Reed Awards and again last week at the American Association of Political Consultant’s (AAPC) Annual Pollie Awards, we were honored for some of the work that we did helping Democratic candidates buck the national trend and win governorships in states that Donald Trump carried at the Presidential level. Rising Tide Interactive was recognized with a Gold Pollie award for “digital advertising” in the gubernatorial candidate category for our work on behalf of Steve Bullock, who won re-election in deep-red Montana by 4 points and outperformed the top of the ticket by 16 points. We also took home a Silver Pollie in the independent expenditure category for our work in North Carolina, where Roy Cooper won back the governorship from Republican control in a state that Donald Trump carried at the presidential level. 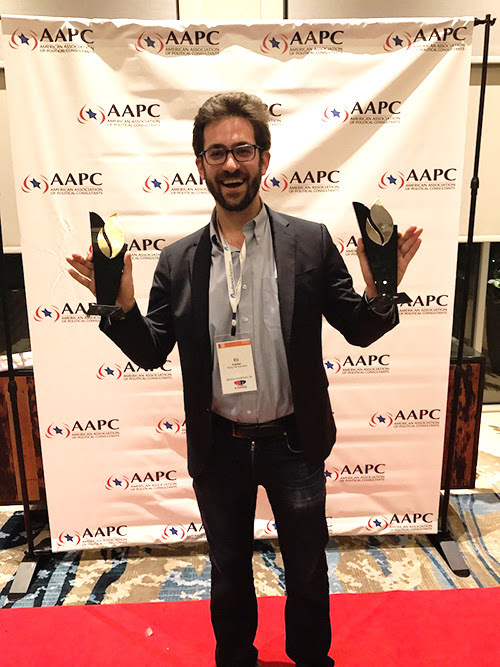 Additionally, last month at the Reed awards, we won “Best Use of Display Advertising for Independent Expenditure Campaign” for our work in North Carolina on behalf of Progress NC. The Reed Awards are named after Campaigns & Elections magazine founder Stanley Foster Reed. The awards recognize excellence in political campaigning, campaign management, political consulting, and political design. The winners represent the best in the industry from across more than 100 categories for television, radio, direct mail, phones, field, political technology, and online advertising. We’re thrilled these organizations honored the successes our clients achieved this year. We count ourselves as incredibly fortunate to be working with such amazing Democratic candidates and for the advancement of important progressive policy priorities and initiatives.